The Child Support Agency in the UK handles just over one million child maintenance cases per year. With the expense of raising a child increasing annually more parents than ever before are asserting their rights and pursuing non-paying parents. Childcare is the biggest financial outgoing in a family. Raising a child in the UK until the age of 21 will cost just over £200,000. Data from the Child Support Agency (CSA) shows that non residential parents assessed by the CSA pay between £21 and £33 per week. In March 2010 there were 840,000 cases where maintenance was due out of total 1.15 million cases assessed. Outstanding child maintenance arrears stood at £3.761 billion by March 2010. For many parents the fight to ensure that child maintenance is paid can begin before the child is born. Vicki Scott, 33, fell pregnant four months after meeting her boyfriend Sam. “I was actually using the contraceptive pill, which unfortunately didn’t work as I was ill with swine flu,” said Vicki. “When I was eight weeks pregnant Sam began to change, he had anxieties about becoming a father and became increasingly volatile and unpredictable towards me.” It became apparent to Vicki that Sam has some emotional and mental issues but instead of seeking help Sam decided to end the relationship. When Vicki was 15 weeks pregnant Sam contacted her with an offer of child maintenance payments. “I hadn’t threatened him with the CSA at this point because that process can only begin once the baby is born,” said Vicki. “Out of the blue he contacted me to say he wanted to be involved and would pay maintenance.” An agreement was made for Sam to pay £150 per month and to set up a trust fund of £50 a month until the child was 18. The trust fund was to set to begin one month before the child was born. It is not uncommon for non residential parents to make promises of child maintenance and then decide otherwise. 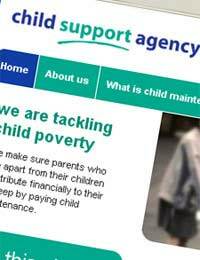 Over 150,000 non residential parents who are assessed by the CSA each year refuse to make payments toward their child’s upkeep. “When I was 30 weeks pregnant Sam said he was withdrawing his maintenance offer and he doubted whether he was the father.” Sam also demanded a DNA test once the baby was born and stated he would not be paying for the test. It was at this point Vicki decided to contact the CSA to find out what her rights were. The Child Support Agency assessed Vicki’s case and informed her that Sam was responsible for paying the DNA test as he was the one doubting parentage. If Sam refused to pay then the CSA had the legal right to assume his paternity and to continue with the maintenance payments process. If Sam refused to pay child maintenance then the CSA would have the right to remove payments before they reached his bank account. Sam’s last known salary was £12,000 and from this Vicki would receive £29 per week in child support payments. According to the CSA Sam will now pay £125 per month towards the upkeep of his child. According to the data the average monthly financial upkeep of a child in the UK is £800 per month until the child is 21. “The money Sam is being forced to give will initially cover the cost of nappies and that’s all, “said Vicki. “The last I heard he had a better paying job, a new girlfriend and was arranging a holiday abroad.” Sam has since contacted Vicki to inform her that he will no longer be setting up the trust fund for his child. Vicki’s fight to receive child support payments is far from uncommon in the UK. There are many single parents struggling in the UK to bring up their children with little or no financial support from non residential parents. More information on child support and maintenance rights can be found at the Child Support Agency website. I'm doing pretty well in my career and my ex has decided to stop working altogether to go on benefits. She already receives a decent amount in Child Maintenance payments but my son still comes to me in rags that are too small for him. She goes out every weekend, smokes weed and walks around in new clothes all the time. Clearly the money isnt going on my son.It's likely I'll be getting a promotion soon which means my CSA payments will increase by over £100pm. She clearly doesn't use this money for my son so I was wondering what the legalities were of putting this increase into a trust fund for him as long as I can prove this is where the money is going. Unfortunately for you, this is not an option as child maintenance has to be paid to the parent with main care. You could consider applying for majority care/full residency yourself? I'm doing pretty well in my career and my ex has decided to stop working altogether to go on benefits. She already receives a decent amount in Child Maintenance payments but my son still comes to me in rags that are too small for him. She goes out every weekend, smokes weed and walks around in new clothes all the time. Clearly the money isnt going on my son. It's likely I'll be getting a promotion soon which means my CSA payments will increase by over £100pm. She clearly doesn't use this money for my son so I was wondering what the legalities were of putting this increase into a trust fund for him as long as I can prove this is where the money is going. I feel your pain I also have been made to pay £630 direct from my wages my rent is £950 a month and leaves me with no money to eat or Pay bills I have been told by the cms that it’s not their problem my ex earns in excess of £70k after tax and NI but they do not take his into account at all. this is him just making sure I pay for Leaving him for my own safety. I gave him 50/50 access when I left and he took me back to court to gain full parental responsibility so he could keep the house. I think it’s so unfair that they are allowed to push the parent that’s paying into financial crisis I’m also pregnant now and can’t get any help at all. I want to be able to pay towards my children but not to the pointof not being able to eat or pay essential bills. And how much is "Vicki" earning? Why aren't her earnings taken into account? He is the father, it's his responsibility to contribute something towards his child's upbringing.